Tennyson may be right that “In the Spring a young man’s [and woman’s] fancy lightly turns to thoughts of love”; but in my stage of life, fall too often turns my mind to thoughts of loss. The shortened days depress me. While I thought nothing of going out after dark with Lev, nine autumns later I am still uncomfortably surprised by the darkness when I leave home alone to join friends for dinner—or worse, to go to dinner or a party alone. And at no time is the empty chair so painfully obvious than during the Holidays. Someone is missing! Each year—each holiday and major life event—I am reminded of my loss. This is part of every widow’s new “normal.” Grief is not a one-time occurrence. 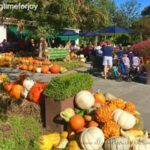 Frequently I read blogs and tweets by those who grieve, as well as by those in the grief counseling industry, that tell us how emotionally fragile we are and that advise us to withdraw in quiet solitude rather than run the risk of becoming emotional in front of other people at Holiday parties. To which I respond, “Bull!” Instead, I choose to join the party, to have a party. I choose joy. And while finding joy when the empty chair is so obvious is difficult, it is not impossible. I am going to accept invitations to go out. At first you don’t feel like seeing people, and so you turn down invitations. People want to be kind; but if you keep saying ‘no,’ they will soon forget you and move on. So each year as the Holidays approach, I start planning. What would be worse than trying to ignore Thanksgiving or Christmas, to sit home alone in an undecorated house while everyone else in the world is celebrating? Since Year 1 of widowhood, I have decorated my house for the Holidays. And what is the point of decorating if I have no one over to share it with? So I entertain. Only rarely is it a big, elaborate party. Usually, it’s a simple, quiet evening with good friends or family—celebrating December birthdays, commemorating my December wedding anniversary, gathering together those who have shown me special kindness during the year. It’s a time I focus very intentionally on gratitude—all I have to be thankful for, all the people I care for, all the happy memories from the past, all the years with Lev. I have found that when my heart is filled with gratitude, I have little room for immobilizing anxiety, fear and sadness. Gratitude exposes my soul to the peace of God, which is the first step in reclaiming joy. 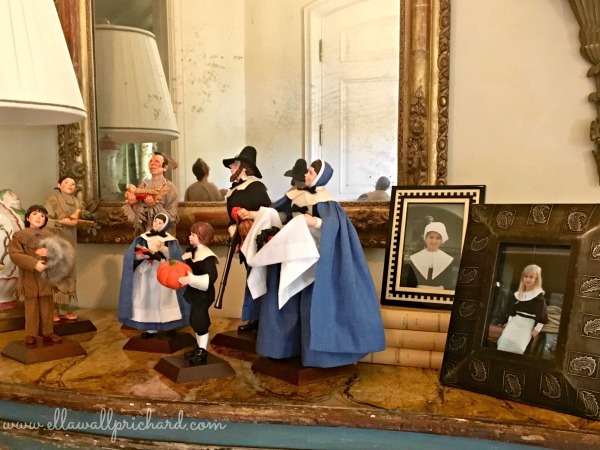 Last week I pulled out the pumpkins and the Pilgrims and decorated my house and my table. 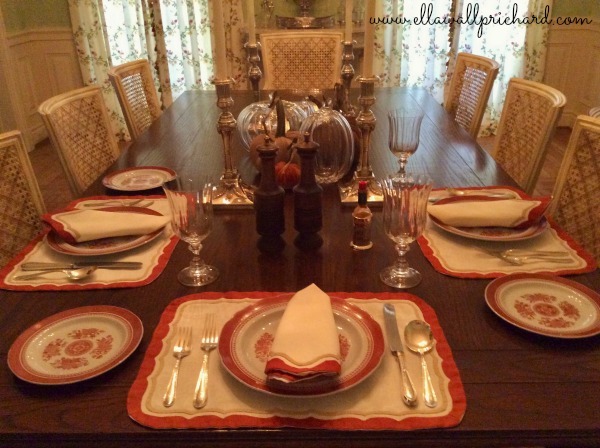 I set the dining room table with my mother-in-law’s old Spode ironstone and her harmonizing orange-trimmed linens and invited my daughter and son-in-law over for a simple meal of baked flounder on a bed of fall vegetables. I have called a dozen single friends to come for a simple Sunday supper…all those “s’s”—soup, sandwiches, salad, sweets. And good wine of course. I will be happily cooking the rest of the week, joyfully anticipating a relaxed, casual evening to kick off a week of celebration. I am ready for the parties. 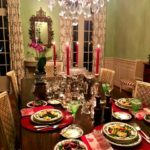 And if you’re not accustomed to hosting dinner parties, this article in a recent New York Times is a basic guide: How to Host a Dinner Party. Ella’s memoir, RECLAIMING JOY, is scheduled for publication in 2018 by the Baylor University Press. I wish I were closer geographically. Thank you for words or wisdom. Me too, but aren’t we fortunate that modern technology allows us to stay in close touch despite physical distance? Grace and peace…praying for joy for you this Christmas season.